On August 16th, 2011, the U.S. Consumer Product Safety Commission, in cooperation with Radio Flyer, announced a voluntary recall of their Scoot ‘n Zoom riding toy due to a fall hazard. Consumers should be aware that the riding toy can tip over, allowing a child to fall forward while riding and thereby posing a fall hazard to young children. As of August 16th, 2011, Radio Flyer has received reports of ten incidents with six injuries, including three where teeth were loosened or removed, and three with chin lacerations requiring stitches. Approximately 165,000 of these riding toys were sold at Walmart and other retailers, and online at Amazon.com and Target.com from August 2010 through August 2011 for about $20. 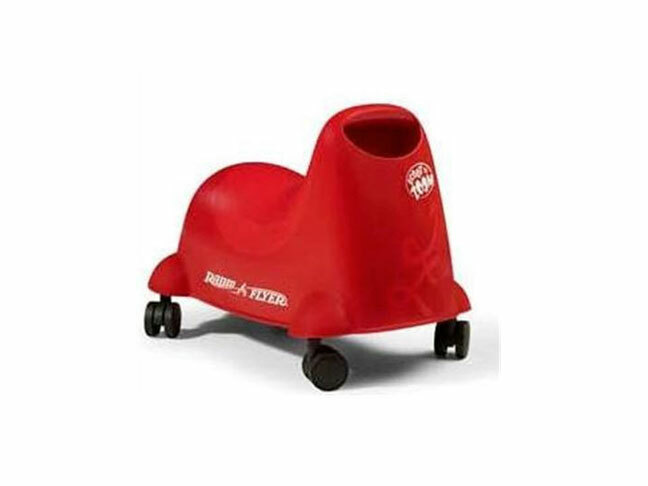 The riding toy is red molded plastic with black wheels and measures 19 inches long, 11 inches wide and 13.5 inches tall. The riding toy’s model number 711 can be found molded on the underside of the toy. 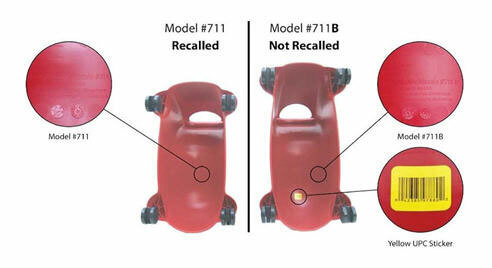 Units with a yellow UPC sticker underneath the product with model #711B are not recalled and the image below will help you to identify if you have one of the recalled models. Consumers should immediately take this product away from children and discontinue use of this product. Consumers can contact Radio Flyer to receive a free replacement unit or refund. For additional information about this recall, contact Radio Flyer at (800) 621-7613 between 9 a.m. and 5 p.m. CT Monday through Friday, or visit Radio Flyer’s website. Other general information on this recall can also be found at the CPSC website. Consumers should be aware that it is illegal to resell or attempt to resell a recalled consumer product.